[Ed. Note: Visit Seal to see more images of the heartless Canadian seal hunt. 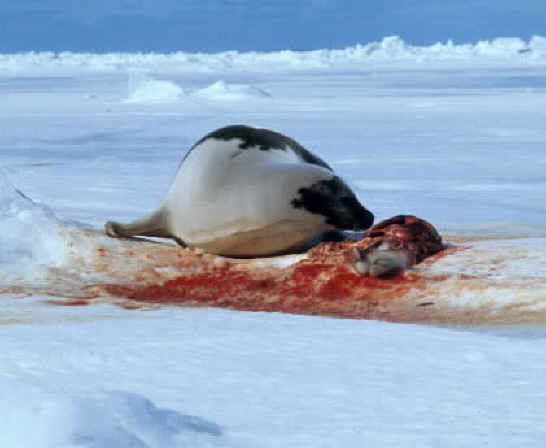 Poll after poll1 demonstrates most Canadians oppose the seal slaughter. It directly impacts the lives of 4,000 or less people in Newfoundland and Labrador. The total annual income has been a few million dollars — while part-time seal-killers make a pittance to risk their lives — yet our government promises to waste millions of dollars to challenge an intelligent, overdue ban. There are generally two sides to a story, but in the case of seals, the majority of Canadian views are being grossly misrepresented at the International level. The European Union (EU) recently banned imports of commercially-killed seal products (fur, oil and flesh), denying Canadian seal-killers profits. Key markets now closed to seal pelts include Denmark, France, Germany, Italy, Finland, Greece and Poland. Since the ban on importing baby harp seal pelts was first proposed, Canada’s delegates have defended Newfoundlanders by supporting the seal market, rather than pressing for an end to many decades of misery for seals, and all who want the bloodshed stopped. Where’s the democracy? The proper function of Canada’s government is to represent its people, and the majority oppose a commercial seal slaughter which embarrasses this nation. Let’s finally be done with this annual bloody debacle — cease propping up the antiquated and frivolous fur industry, and leave the seals in peace. Direct the funds to a license buy-back for the next few years (which the industry supports2), and then shut it down. Let’s, please, move on.